The 14th through 16th of August is one of the biggest local events of the year: the festival of the Virgin of Urkupiña, which occurs just a few miles west of our house. Tens of thousands come from all over to celebrate and make petitions to the Virgin. There are three or four days’ worth of major activities and the events continue on throughout the rest of the month. Yesterday was the finale. Rather than rewrite the entire story of the event, I will provide this link to a very well-written article. It’s not very long and I encourage you to read it if you have time. I have included captions on all of the photos below to explain the process as I saw it. 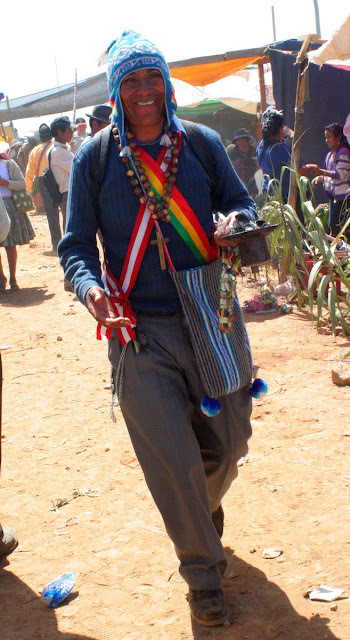 Essentially, this festival is a combination of the old Andean religion centered on Pachamama (Mother Earth) and the veneration of Mary, a central theme in all areas of life here. My brother volunteered to act as my tour guide on the 16th, the “high day,” known as Calvario. It was a defining experience for me, as it was the first time since coming here that I have truly felt like an outsider. The most remarkable thing about the whole experience is that all ages and social classes were represented. I saw old men and women, children, and youth. There were city folks, country folks, rich, and poor. This is deeply embedded in the culture of the people and the way they think. 1. Break a piece of bedrock out of a “mine.” Have it blessed by an andean shaman (involving charcoal fire and beer), along with miniature items representing things you would like to own in real life. 2. Rent a miniature lot that represents the land you wish to possess. Populate the lot with the miniature items, blessed by the shaman. Sit and enjoy your lot for awhile, drinking beer (pouring some on the ground, of course, for Pachamama/Mary), and lighting off firecrackers occasionally.